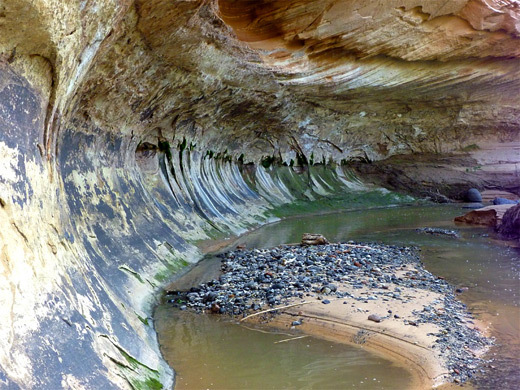 Unlike many of its numerous tributaries, the 85 mile long canyon of the Escalante River stays relatively wide all the way from Escalante town to Lake Powell, and a hike from start to finish can be completed in around 6 days, via a combination of wading in the river and walking along trails across the extensive grassy banks at either side. But most people come here for shorter trips, in particular the section between the town and the UT 12 crossing, since these are the only two points accessible by road. This part of the canyon is 15 miles long so could be done in a day, if a car shuttle is available, however one option for an even shorter, there-and-back hike is the 2.5 miles of trail west of UT 12, as the scenery is the most varied; besides the river itself, flowing serenely through a corridor of trees, and the plentiful wildflowers on the surrounding meadows, this walk passes five features of note. These are Escalante Natural Bridge, a skyline arch, some Anasazi ruins, a petroglyph panel and a narrow tributary canyon (Sand Creek), which can be followed as far as desired, past pools, cascades and overhanging cliffs. All this stretch of the Escalante canyon, while not continuously sheer-walled, is bordered by the tall, extravagantly streaked cliffs of reddish Navajo sandstone that characterize all drainages in this region. Topographic map of the Escalante River Trail. 20 views along the Escalante River Trail; gallery, slideshow. 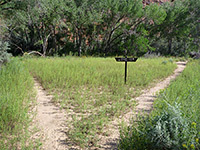 The Escalante River trailhead is one of the most popular in the area owing to its easy access and the variety of possible (overnight) trips that either start or end here, including to Pine Creek, Death Hollow, Sand Creek, The Gulch and Boulder Creek, yet even so, a typical day may see only 2 or 3 vehicles parked. The trailhead is located on the west side of the highway just north of the bridge over the river, in a tree-lined enclosure adjacent to a private residence. At the trailhead, the canyon is relatively narrow but soon widens, becoming half a mile across, and remains similar for the 2.5 miles to Sand Creek, before narrowing again further west. The trail fords the river every half mile or so, the first crossing being just after the start, beyond a fork in the trail marked with a sign stating Lake Powell 70 miles, Escalante 15 miles. The cloudy Escalante River water is generally just a few inches deep and flows swiftly, across a floor of sand or small pebbles, and is always completely shaded by the bushes and trees that grow thickly along the edges and join together overhead, creating a cool, greenish passageway through the desert surroundings. The trail winds through woodland for a short distance but is soon traversing grassy, sandy flats - hot in summer - and sprinkled with cacti and many different species of wildflowers. 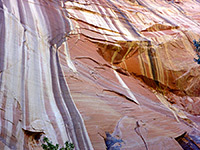 The enclosing cliffs rise up to 400 feet above the river and are quite spectacular, especially on the south side where the sheer rock faces are streaked with wide, multi-colored bands of desert varnish. The north side of the canyon is less steep, the cliffs here split by benches and small ravines. 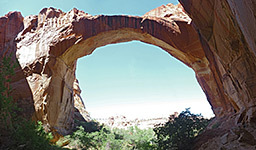 After rounding a few wide bends and crossing the river several more times, the path reaches the first attraction, 130 foot high Escalante Natural Bridge. 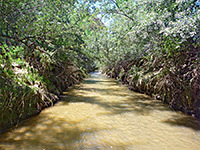 This is an arch rather than a bridge (created by erosion not water), though does resemble a real bridge, with a flat top and vertical, tapering supports. The arch has formed in the richly-colored red-orange rocks on the south side of the canyon and is parallel to a sheer cliff face, so the feature is most dramatic if viewed from behind, looking back north through the opening towards the opposite canyon walls - a location reached by walking up the short stream that runs from the arch, and climbing the boulder-strewn slope at the end. Next stop are the Anasazi ruins and rock art, also on the south side of the river, at the top of a hillside about 50 feet above the river. The ruins comprise three stone rooms all topped with the original roof timbers, built in a secure alcove protected from casual entry by a 20 foot cliff. 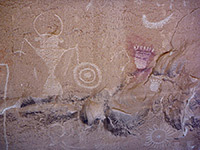 A red, zig zag-shaped pictograph is painted onto the canyon walls beyond, while on the base of the cliffs are a mixture of petroglyphs, new and old graffiti - the latter dating back to the early 20th century. A short distance beyond the ruins, the canyon walls on the south side are especially tall and sheer, and one point at the top has eroded to create a graceful skyline arch; the opening is narrow but long, visible for some distance up and down the river. The first major tributary joins the Escalante from the north a few hundred feet beyond the arch; this is Sand Creek, a very long drainage originating on the slopes of Boulder Mountain. Its canyon is wide at the confluence but soon narrows and is rather overgrown, a little difficult to follow in places, though quite scenic. 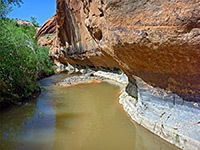 Short paths across the bushy sand banks provide a partial alternative to walking in the water, which is generally a little deeper than in the Escalante, and as the name of the creek suggests, flows over frequent patches of quicksand. The stream runs beneath colorful cliffs, through pools and cascades, and past several subway-like sections where the channel is bordered by curving rock faces.